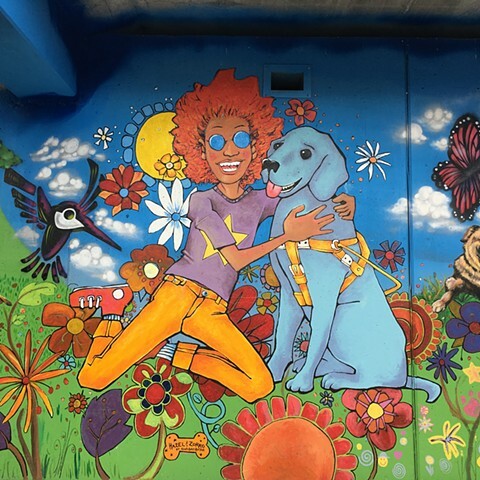 In the summer of 2016, I participated as a Featured Artist in the Logan Square Dog Park Mural, a project organized by AnySquared and Artistic Bombing Crew. The mural brought together both veteran and upcoming street artists from Logan Square and throughout Chicago, and more traditional "paintbrush" artists, such as myself. The complete mural is roughly as long as a football field, and incorporates the work of nine featured artists, ten street artist crews, and many additional artists and community members who assisted during Community Paint Day and beyond. I painted Hazel and Zorro, two characters from my webcomic, Freaks' Progress . Zorro is a service dog and companion for Hazel, who is blind.